This week, we have the magnificent Kate Messner. Kate grew up in Western NY, graduated from Syracuse University’s S.I. Newhouse School of Communication with a degree in Broadcast Journalism, and worked as a television news producer and reporter in Syracuse, NY and then Burlington, VT, before going back to school to get a teaching degree. For the past twelve years, Kate has been a teacher of middle school English. In 2006, she earned National Board Certification in Early Adolescent English Language Arts and frequently gives teacher workshops on technology integration, differentiating instruction, and of course, reading and writing across the curriculum. She lives on Lake Champlain with her husband and two kids and loves spending time on the water and in the mountains. Here’s a little bit about Kate’s book THE BRILLIANT FALL OF GIANNA Z – Walker Books for Young Readers (September 2009). Gianna Zales is a star runner with one more hurdle to jump before she goes to cross-country sectionals – a monster leaf collection project. But to get it done, she’ll have to survive a little brother who thinks he’s a member of the paparazzi, a grandmother who leaves her false teeth in the refrigerator, a rival who desperately wants to take her place at sectionals, and a best friend whose feelings about her are changing like the leaves. Gianna Z needs a stroke of brilliance to make it work! My agent called my cell phone while I was driving my son to soccer practice to let me know that Walker Books for Young Readers had made an offer. I think I screamed, or at least squealed, because my son immediately said from the back seat, “Does somebody want your book?” Somebody did, and in fact, we were operating on a fairly short timeline for publication, so I was working on revisions within a month. In some ways, it’s impossibly exciting, but in many other ways, nothing has changed. I still sit down at my computer every night to work on my current work-in-progress, and I still have the same worries about whether it’s good enough. 2009 is circled on my calendar, though, and every so often something happens to remind me how very real it is! There are so many benchmarks along the way – line edits, copy edits, author photos, contact from the publicity department – and I’m trying to enjoy every minute. I’ve always loved writing, but I grew up in a small town, and we didn’t have authors visit our school, so to me, they always seemed like far-away experts – not ordinary people like me. I had been actively writing books for kids since 2001, attending conferences, submitting, getting rejections, when a small regional press bought my first middle grade historical novel, SPITFIRE, about a girl who disguises herself as a boy to fight in a Revolutionary War battle on Lake Champlain. I wrote a second regional historical novel with that publisher and enjoyed working with them, but I wanted my next book to have a wider audience, so I started querying agents in the summer of 2007. That December, I signed with the brilliant and scrappy Jennifer Laughran of ABLA. She sold my novel, THE BRILLIANT FALL OF GIANNA Z, to Walker Books in the spring. While she was shopping it, I kept working on other projects, and we actually found homes for those before the novel sold! My chapter book series, starting with MARTY MCGUIRE, FROG PRINCESS, will be published by Scholastic Press, starting in 2010, and my first picture book, OVER AND UNDER THE SNOW, will be published by Chronicle Books. My most heart-breaking rejection was from the first agent I queried. I had met her at a conference and felt SURE she was the one. She had asked for extra time with an exclusive on a full manuscripts and had promised to let me know within a week. I was camping with family that week and checked email obsessively. When the email finally arrived, it was a rejection – a lovely, kind one, but a rejection all the same. I was so disappointed. My best rejection came from an agent who took the time to write a personal letter describing a problem with the beginning of my novel. After I read that letter, I cut the first three chapters, rewrote some parts, and submitted the manuscript successfully to the agent who represents me now. I was – and still am – a full-time middle school English teacher! Oh gosh…how much time do you have? I worry about living up to expectations, about how my books will be received. Putting a book out there in the world is so wonderful and yet so terrifying in some ways. Mostly, though, I’m thankful that one of my dreams has come true, and I try not to let the worries overshadow that. It’s been fantastic! My editor started the process by sending me a four-page revision letter, detailing what she felt were the major issues with the manuscript, and I can honestly say that all of the issues she raised rang true for me. I worked through her list and used a checklist of my own to revise. Then, she sent a second letter – two pages this time – with line edits on the manuscript, and I made more changes. Copy edits came next, and I learned a lot about the nitty-gritty details of my writing. For example, I sometimes write compound words as two separate words, and I reaalllllly love commas! I teach during the day and have two kids, so my writing life begins after they’ve gone to bed at night. I generally write from about nine to midnight, and I aim to get in at least a thousand words a day if I’m working on a new project. In addition to that time, I “steal” writing time whenever I can. I’ll often work on revisions while I’m watching my daughter’s skating lesson or waiting for my son to finish soccer practice, and I scrawl little notes all the time. Give yourself time to practice and learn your craft, and don’t feel guilty about taking that time. That includes reading as well as writing. Read at least a hundred books in the genre in which you want to write to get a sense for how things work – or not – in that style of writing. If you write for children, try to do some of that reading out loud. You’ll get a much better sense for the music of picture books and middle grade novels, for the language of a chapter book or the voice of a YA novel. It’s not exactly a book on craft as much as it’s a hilarious collection of inspirations, but I love Anne Lamott’s BIRD BY BIRD. Bits of that book have gotten me through my most frustrating writing days, and without it, I’m not sure I’d be answering these questions as a debut author right now. Finally, Snoop wants to know: where, oh where, do you get your ideas? During my school visits, kids always like to know where I get my ideas. The answer is…everywhere! I carry a notebook with me, so when I have an idea, I can scribble it down right away before I forget. I wrote the first draft of my picture book OVER AND UNDER THE SNOW (Chronicle Books) on a school bus on the way home from a 7th grade field snowshoe field trip in the Adirondacks; it’s scribbled in bumpy bus writing on the back of an attendance sheet. I think one of the most important things to do if you want to be a writer is to lead an interesting life. Go outside. Try new things. Talk to people, especially people whose lives are different from yours. And don’t pass up opportunities. 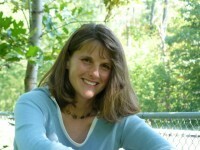 This concludes our interview with our latest author, Kate Messner. We wish her much success with her debut novel TTHE BRILLIANT FALL OF GIANNA Z. To see what Kate is up to these days, visit her website at http://www.katemessner.com or her blog at http://kmessner.livejournal.com. we all know how it feels to “steal” time. 🙂 Your’s is paying off Kate. Thanks Cynthea for the great interview.